« What’s it all about? The Experience!!!!!!! 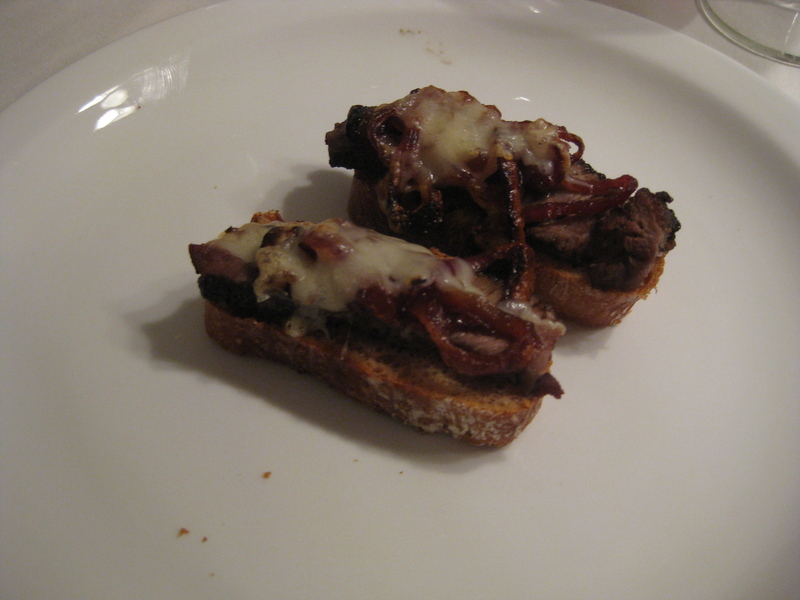 Game Time Recipes: Open face BBQ Goose breast sandwich. Since we are stuck here again in this winter mess, I decided to go to the freezer. What better way to enjoy being stuck in the house than a couple of Canadian goose breasts that have been marinading in the freezer for a couple of months. I decided to prepare these in a little different way than usual. Usually I would make a roast with potatoes, carrots, onions, you get the picture. No, not this time. So I figured I would share this recipe with you. You can marinade the goose breast(or duck) in what ever you prefer. I prefer oil, Worcestershire, lite soy sauce, salt, pepper, garlic powder, Emiril’s essence, and Canadian steak seasoning. Now take the breast and slice it very thin and on an angle across the width of the breasts. When you get it all sliced set aside. Get yourself your choice of bread, or bagel and toast each piece. When toasted, place frying pan on high heat. Butter the bread lightly and set on cookie sheet. When the pan is nice and hot add some oil to the bottom of the pan just enough to stir fry. Place goose meat in pan and stir quickly. Add some Sweet Baby Ray’s bbq sauce(or your favorite) to lightly coat and salt and pepper(you can also add onions and peppers). Stir til the meat is medium and remove from pan. Top bread with goose meat. Place a piece of cheese on top of each piece of bread I use provolone or swiss. Now place in oven, broil til cheese is melted and hot, do not burn bread. Now eat with your favorite side for a delicious lunch or dinner. You could also use a sub bun and cook meat with onions and even peppers to make a great tender steak sandwich. Now most people think Goose is greasy and dry, try this recipe and you might think again. Hope you all enjoy it, I know I did and will continue to in the future. This entry was posted on February 22, 2011 at 5:13 am and is filed under 6or7, antlers, archery, bear, deer, experience, fishing, g5, guns, Hunting, outdoors, recipe, reviews, sheds, sportsman, team dirt, typical, Uncategorized with tags 6or7, antler king, archery, bear, bows, deer, duck, fishing, g5, guns, hoyt, hunting, moose, mossy oak, outdoors, rabbit, real tree, small game, sportsman, squirell, target, team dirt, thenontypicalsportsman, typical, waterfowl. You can follow any responses to this entry through the RSS 2.0 feed. You can leave a response, or trackback from your own site. thanks for the recipe … sounds good! I think it is very good.. Hope you like it, let me know when you make it what you think. Sounds good. Let me know when I can be a taste tester!